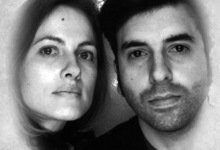 Anja Dornieden and Juan David González Monroy are filmmakers based in Berlin. Since 2010 they have been working together under the moniker OJOBOCA. Together they practice Horrorism, a simulated method of inner and outer transformation. They have presented their work internationally in a wide variety of venues. They are currently members of the artist-run film lab LaborBerlin.